Welcome to the Math Salamanders 1st Grade Math Worksheets. Here you will find a wide range of free printable Counting Worksheets, which will help your child understand how to count on and back by 1s 5s and 10s and understand place value to 100. The sheets have been graded in order of difficulty with the easiest ones first. 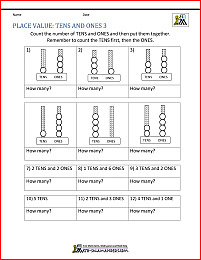 Here you will find a selection of 1st Grade Math worksheets designed to help your child understand how to count on in 1s 5s and 10s up to 100.
decide whether a sequence in increasing by ones or tens. 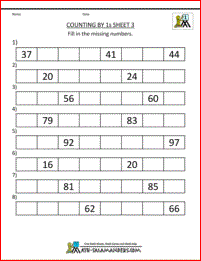 Take a look at our Printable Counting Worksheets page with numbers up to 50. 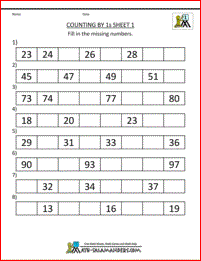 On this page, your child will learn to count objects in groups of tens and ones up to 50. 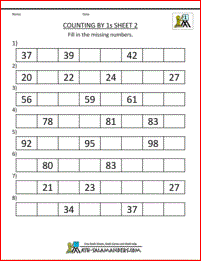 Take a look at our 2nd Grade Counting Worksheets page with numbers up to 1000. 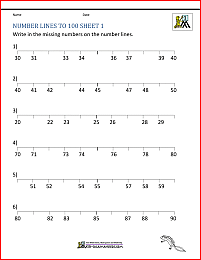 On this page, your child will learn to count on and back by 1s, 2s, 5s, 10s and 100s.